Around 15 years ago my interest in coarse fishing was revived after an extended lull and I negotiated a lease on a small lake only a few hundred yards from my house. For the last few years I have shared this with Chris Dixon as it borders his ground and he was prepared to share the cost rather than it pass to someone he did not know. Over that period of time I have fished there intermittently with nothing very exciting to report in the way of big fish, although it is a beautiful place to relax and do nothing but watch a stationary float. It's too cold for fishing for me at present, although my brother had an interesting day at the end of last year when a small Rudd his friend was reeling in was attacked by a large Pike. The following day I spent a few hours spinning and dead baiting trying to catch this monster, but without any luck. I have seen only one pike caught during the time I have fished the lake and that was by my old school friend and fishing pal Bill Branch. It weighed around 5 pounds but unfortunately I can't find the photo I took. Eight years ago I caught a 7-pound pike down the bottom of my garden in the Arun, which I also put into the lake. 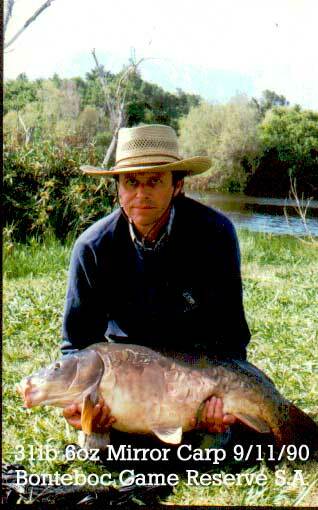 A chap who works at Hillier’s Nursery told me that he caught a 20-pounder about 40 years ago, not long after the water was created. There are certainly plenty of small fish for a pike to get fat on, but as a general rule pike don’t seem to grow to a great size in small waters. Incidentally, Bill is a world famous herpetologist (as you will see if you click on his link) who has lived for most of his life in South Africa. If I run out of material for this column in the future I will include an account and pictures of Carp I caught (here's one to be going on with) when I stayed with him in SA for a couple of months. I regularly see Tawny Owls when I fish at dusk in the summer, but for the last 5 years I have been disappointed that the owl box that I put up near the lake has not been used other than by squirrels. Colin Carver (don't forget to come to his new slide show in Feb) tells me that it is important that any nesting materials (of squirrels) that are clogging up the box are removed during January and February to persuade the desirable tenants to take up occupation. I dutifully did this a couple of weeks ago (nearly falling out of the tree in the process), although this time there was not much material to remove. I was walking my first spaniel Kerry many years ago on the footpath by the side of the lake when she darted forward and grabbed a Tawny Owl on the ground. Being a well-trained gundog, she brought it back to me and I took the "retrieve" from her. 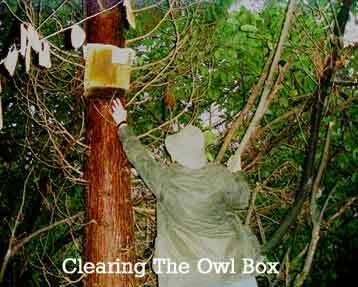 I held it in my hand for while until it flew off in a daze and settled in a tree only six feet above the ground. I carried on walking the dog and when I came back 20 minutes later it was still there. Eventually it came to its senses and departed. Perhaps the local owls have had nightmares about ferocious spaniels and won’t nest near. My neighbour Michael Martin, has had quite a lot of success over the years with his owl boxes but these have been in comparatively open situations. If they don’t use mine this year, I will admit defeat and move it to new spot. We have had very little rain this month* so far and the Arun (which run by the side of the lake) has barely been above summer levels. Last year for the first time in over 25 years the river rose high enough to flow over the bank into the lake. I was told be the aforementioned chap at Hillier’s this was a common occurrence some 40 years ago. But then around 40 years ago it was quite common, according to my next-door neighbour, to see Otters in this part of the Arun. Loss of habitat and low water levels are presumably the main cause of their demise; although I have heard of (unconfirmed) recent Otter sightings as near as Bucks Green. In my early teens they were quite common all over the country. Although they are mainly nocturnal, I sometimes spotted one or more in the daylight during my many fishing expeditions. 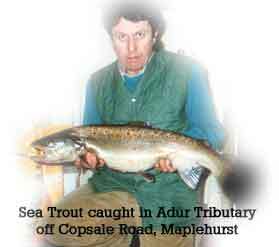 The lack of rain has also meant that the Sea trout that run up the small tributaries of the Adur to spawn through Maplehurst, Copsale and Nuthurst have not been able to do so. It will be interesting to see whether they will if we get some good floods. I presume they are still waiting in the estuary or more probably they drift up and down the tidal part which, in the case of the Adur, is up to around Mock Bridge north of Henfield. 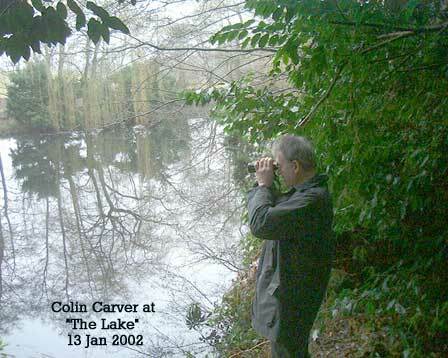 I normally rely on Colin Carver for information about fish in the local streams. I will let you know of anything he has to report. Some of you may be amazed at the size of Sea trout that struggle up the small local gills. One of the largest I personally have seen was a little over 10 pounds. It was stranded in a small pool just in the stream crossing Copsale road and there seemed little chance of it being able to return to the sea so I thought I would eat it rather than leave it for a mink to finish off. The picture shows the fish with me at home in my kitchen. It was very tasty. These winter months are taken up mainly by rough shooting for me. A bit more activity involved for the dog and myself to keep warm. I would prefer to walk with the dog rather than stand by a shooting peg or sit by a fishing rod freezing to death. Watching the dog do it's stuff is more exciting than shooting for me anyway. 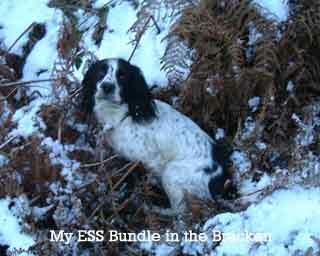 Spaniels are not made for standing around. I will try to get some fishing in when the shooting season is over at the end of this month. I renewed my membership of the Sussex Wildlife Trust today. If you care about wildlife and conservation you should be a member. * Plenty of rain a few days after I wrote this. Have you signed or viewed the Guest Book? Have you contributed to the Forum?